Railway (NWR) recruitment - vacancie 2,090 of Apprentice. 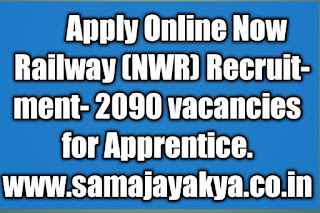 Recently North Western Railway (NWR) has declared a recruitment notification for vacancies 2,090 of Apprentice. Interested candidates can apply online from the dated 30-11-2018 to 30-12-2018. General/OBC - Rs. 100 candidate can pay online by Net-banking/Credit or Debit Card. SC/ST/PH/Women : no fee. Interested may apply online by NWR website - http://www.nwr.indianrailways.gov.in - from 30-11-2018 to 30-12-2018.